Not so many years ago, the idea of walking for exercise would have seemed crazy, insane, ludicrous. Walking was simply a means of getting from A to B – something that everybody did whether they wanted to or not. Fast forward to the 21st century and walking is something that many of us have to actively seek out. Two cars per family, public transport networks and passive entertainment means that unless you have a dog, walk to work or choose to leave your car at home when you go to the store, you may well find that you have look for walking opportunities and probably you walk less than you realize – and certainly less than a mile a day. Walking is good exercise, and more and more people are turning to walking to help them get – and stay – fit. Accessible, easy and simple, walking is something that almost everyone can, and should, do. While you could just go out for a gentle stroll, you’ll get a lot more from your walking if you put some effort in and follow a more structured program. 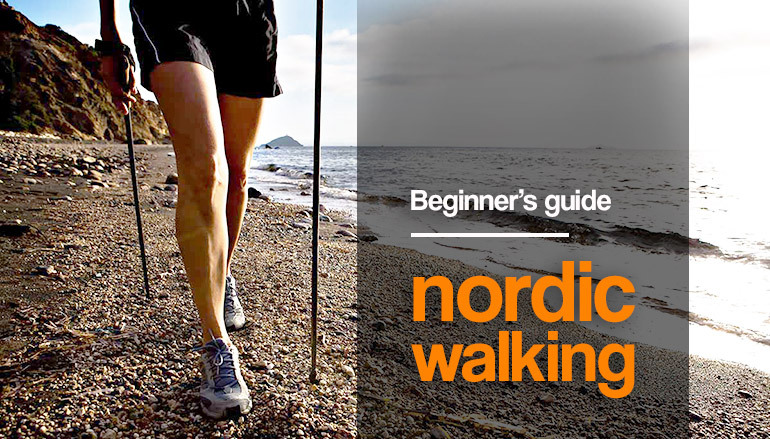 If you really want to take walking to the next level, try Nordic walking. Nordic walking involves walking while using walking sticks that are similar in design to ski poles. Invented by cross country skiers as a snowless way to maintain fitness, Nordic walking is an all-weather activity that is cheap, accessible and provides an effective cardiovascular and muscular workout. It’s also low impact and safe for most exercisers; both young and old. While walking is a fine exercise, it does not involve much in the way of upper body involvement. Nordic walking changes all that. 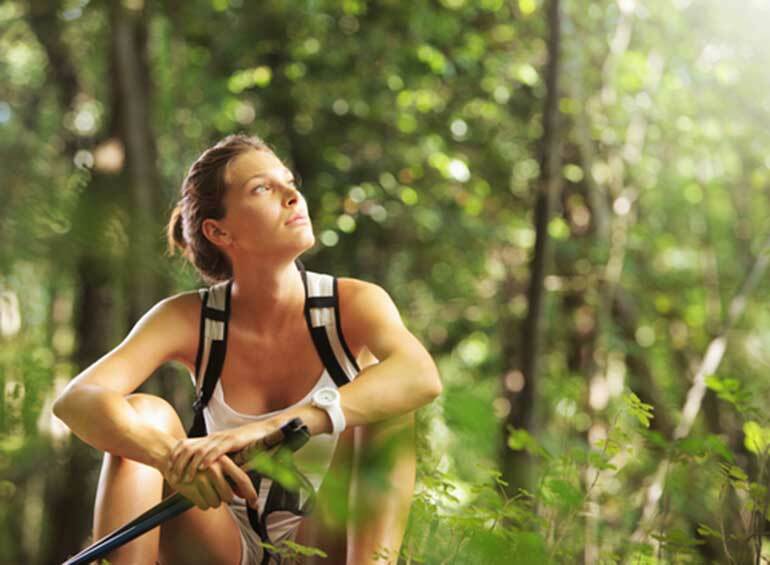 Using Nordic walking poles increases the use of the upper body, so that both upper and lower body muscles are worked. This additional muscular activity results in 40% more calories being burnt and a 25% more demanding workout than regular walking without significantly increasing perceived exertion. You can Nordic walk on paths and pavements, however Nordic walking comes into its own when you head out of the city and into the countryside. The poles can also help you overcome challenging terrain, provide balance and reduce the stress on your knees and hips. As a weight-bearing exercise, Nordic walking is good for strengthening not only your heart, lungs and muscles but also your bones. Nordic walking is similar to regular walking except you take slightly longer strides, use your poles to take some of your weight and to provide a modicum of additional thrust. As you step forward with your left leg, you plant your right pole and vice versa. Your pole should hit the floor at the same time as your feet. Keep your posture tall, shoulders down and back and remember to walk purposely and not simply dawdle. Your grip on the pole should be firm but not overly tight otherwise you may end up with tired hands and sore wrists. The length of your arm swing dictates the length of your stride so do not swing the poles out too far unless you want an especially vigorous workout. Poles – walking poles come in a variety of designs but are generally light, adjustable, have wrist straps and have metal tips with removable rubber covers to you can use your poles on roads. Your poles should feel like they are extensions of your arms so make sure they are the right length for you. The basic formula is to use your height in centimeters multiplied by 0.68 to give the right sized pole for you. You can then fine tune the height of your poles from this initial length. Alternatively, you should adjust your poles so that your elbows are bent to 90-degrees when you plant the pole and you are holding the handgrip. To avoid buying new poles when straps or tips become worn, buy good quality poles from a manufacturer who also makes spare parts. Shoes – while you could walk in just about any type of shoe, sturdy, supportive and cushioned walking shoes or boots will make your walking experience more comfortable. Shoes maybe lighter but boots offer more ankle support. If you are going to be hitting the rough trails of the great outdoors in all weathers, make sure your footwear is waterproof and breathable and matched with a well-fitting pair of socks. Clothing – you can wear almost anything you like when Nordic walking but you should dress for the elements and also allows for the fact that you will get warmer as your workout progresses. Ideally you should dress in layers so you can remove items of clothing as you get warmer. If you are heading out into possibly inclement weather, make sure you have warm, dry clothing with you in your backpack. Before heading out on your first walk, spend a few easy minutes practicing and perfecting walking with poles. Start off slowly and only pick up your pace when you feel able. Initially, walk holding your poles but without allowing them to touch the ground. When you are comfortably swinging your arms and legs smoothly, start to ground the poles. Remember, the pole on the left should hit the ground at the same time as your right foot. Once you feel comfortable walking with your poles, it’s time to go a little further afield. Be conservative with your first few walks to ensure you don’t overextend yourself – walking is supposed to be a mild to moderate form of exercise after all. Start with a few reasonably short walks and only increase the distance as you become accustomed to this new way of walking. Initially, keep to well-trodden paths and then gradually progress to more uneven and challenging surfaces such as wooded trails, coastal footpaths and steeper inclines. If you are looking for Nordic walking support and advice, consider getting some lessons in the correct use of your poles form a qualified Nordic walking instructor. There are also numerous Nordic walking clubs that offer everything from regular weekly walks to full-on Nordic walking holidays. Like any form of exercise, Nordic walking is only beneficial if you do it often enough. If it is going to be your main form of exercise, you should aim to clock up around 15-miles of walking per week so you experience all the health and fitness benefits this activity has to offer. Remember to warm-up before and cool-down after your walks and drink plenty of water before, during and after your walking workouts to prevent dehydration. Nordic walking is a great form of full-body exercise that gets you out of your house, away from the gym and into the great outdoors. It combines and effective workout with the opportunity to unplug form technology and enjoy nature. It’s not only a good form of exercise for your body; it’s also good for your mind and spirit. 1. Church TS, Earnest CP, Morss GM. Field testing of physiological responses associated with Nordic Walking. Res Q Exerc Sport. 2002(3):296-300. 2. Shim JM1, Kwon HY2, Kim HR3, Kim BI3, Jung JH4. Comparison of the Effects of Walking with and without Nordic Pole on Upper Extremity and Lower Extremity Muscle Activation. J Phys Ther Sci. 2013(12):1553-6.